I think I've become a bit addicted to Pippa DaCosta's writing, I've read her entire back list since discovering her earlier this year and City of Fae was the last so I'm now going to have to start rereading her books while I wait for the next release! What I love about this author is how different each of her series are and she's introduced yet another world with this one. City of Fae is set in London in a world where humans know about the existence of the fae. The fae arrived here from another dimension and they need to feed from humans to survive, we're able to regenerate the life force the fae take so being fed from wouldn't be a huge problem if it wasn't so addictive. Anyone who is touched by the fae can end up becoming completely hooked and pretty much turned into a junkie who is desperate for their next fix. Although everyone knows how dangerous the fae are people still treat them like celebrities so there are no shortage of fans willing to share their draiocht with them. Alina isn't one of these fan girls though, she's a young woman just trying to make her way in the world and unfortunately she just lost her job working as a reporter. Determined to get back into her editor's good graces she is desperate to find a great story and prove herself. Travelling home on the tube one night she finds famous fae rock star Sovereign collapsed on the platform, she only stops to help thinking she's onto the scoop of the century but she soon finds herself pulled into a dangerous fae underworld that most humans have no idea exists. Alina is pulled into Reign's attempt to stop a fae uprising and the deeper she digs the more secrets she uncovers about her own past. 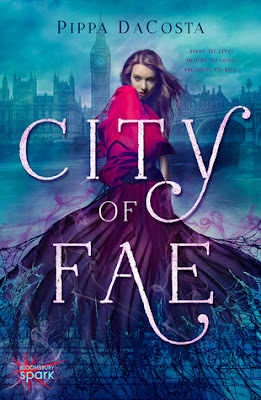 City of Fae is a great start to the series and I'm definitely glad we're getting another book about these characters in the new year. I really liked Alina, she has a lot thrown at her in a very short space of time and although she makes mistakes she tries really hard to figure things out and does a great job of trying to protect humanity. Reign is still quite a mystery but they definitely have great chemistry so even though there are plenty of things trying to keep them apart I'm really hoping their romance will develop further in later books. The setting deep in the secret tunnels hidden beneath London was quite dark and creepy and I have to warn any fellow arachnophobes about the terrifying number of spiders you'll encounter - if you're anything like me you're going to need a cushion to hide behind while you're reading! This was a fast paced and quick read that I thoroughly enjoyed and I can't wait to get stuck into the sequel.